Attending a concert at the Marlboro Music Festival will almost certainly spoil the listener for all live chamber music. It doesn’t get much better than Marlboro, where for more than 60 years the world’s elite and rising musicians have gathered every summer to explore classical music in depth without the pressure of preprogrammed concert deadlines. But, for northern Vermont audiences, it’s kind of a haul to get there. Fortunately for those who live far from the Bennington-Brattleboro parallel, violinist Soovin Kim is bringing a coterie of fellow Marlboro musicians to Colchester to play in this year’s Lake Champlain Chamber Music Festival. Among these are violinists Bella Hristova, Hye-Jin Kim and Arnold Steinhardt; in 1964, Steinhardt cofounded the Guarneri Quartet at Marlboro, which was among the world’s most acclaimed until it retired three years ago. Other musicians from Marlboro include violist Misha Amory, cellist Sophie Shao and part-time Vermonter and LCCMF composer-in-residence David Ludwig. And one not to miss is the pianist Jonathan Biss, who at age 31 has already achieved international fame for his arrestingly thoughtful playing. At the five-concert LCCMF, Biss will play the concluding piece in each of the final two concerts: Mozart’s Piano Concerto in C Major, and Schumann’s Piano Quartet in E-flat Major. Schumann has lately become something of an obsession for the pianist: Biss is about to embark on an eight-month, 30-concert, international Schumann tour. According to his voluble and introspective website, Biss not only loves but feels “protective” of the Romantic-era composer. Asked why, Biss explains, “So often when people say they love Schumann, they say it slightly apologetically, as if his music is lacking in vigor.” It’s the music’s “sense of vulnerability,” stemming from Schumann’s history of mental instability, that makes Biss want to defend it. “You want somehow to be able to rewrite history in such a way that things turned out better for him,” Biss adds. Steinhardt will play the “Chaconne,” the final movement of Bach’s Partita in D-Minor for solo violin. To get an idea of how moving and virtuosic this quintessential violin solo piece is, listeners can hear Kim playing it live in the studio of Boston’s public-radio station, WBGH, on a recent “Drive Time Live” episode, available online. Kim himself is a musician at “that sort of level” and will be playing in each of the five concerts. It’s pure luck — and truly a pleasure for the rest of us — that he spent his childhood in Plattsburgh from the age of 9, joined the Vermont Youth Orchestra at 10, and has decided to bring top talent back to the area every year. Soovin Kim connected to Glazer through the latter’s nephew, Geoffrey Gevalt, who directs the Winooski-based Young Writers Project. Each year, the nonprofit sends what Kim calls “a small army of writers” to listen to and write about LCCMF concerts. “It’s wonderful, because we get to read about how the music is moving them,” Kim adds. Glazer is scheduled to give a one-hour listening-club performance called “Glazer Plays Bach,” but the energetic-sounding and pin-sharp musician says he intends to fit in a piece by Beethoven, two by Chopin and two Liszt pieces as well, including Liszt’s “Rigoletto Paraphrase,” a piano reduction of a quartet from the Verdi opera. He’ll also chat up his new book, A Philosophy of Artistic Performance (With Some Practical Suggestions). Glazer describes his book as “a body of information I’m leaving as a legacy.” The work assembles aphoristic wisdom accumulated over 75 years of teaching “hundreds and hundreds” of students. It ultimately dates back to the lessons he learned about the importance of artistry over mechanics from his first significant teacher, Artur Schnabel. The Austrian’s recorded interpretations of Beethoven are still considered definitive. Glazer studied with him for a year in Berlin in 1932. “This was before chewing gum and Elvis Presley,” Glazer recalls. “I was there when they burnt the Reichstag. It was a terrible time, but it was a good time for artists.” In late May 1933, when Schnabel fled the nascent Nazi Party, Glazer followed him to Italy’s Lake Como for a few months before returning to the U.S. to launch his career. He went on to premiere an Aaron Copland piece at his Carnegie Hall debut, and to teach at the Eastman School of Music for 15 years, among other accomplishments. 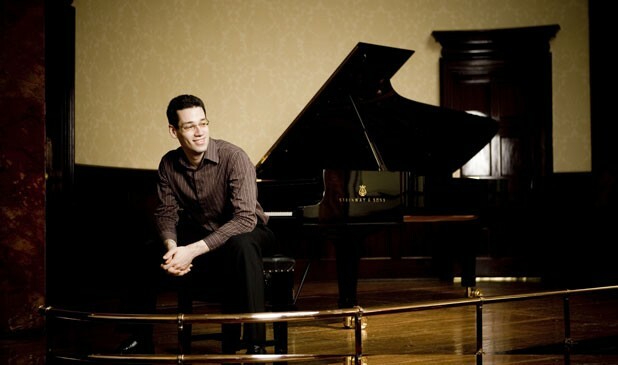 Pianist Frank Glazer plays and signs books at the Lake Champlain Chamber Music Festival’s Listening Club on Wednesday, August 22, 1 p.m., at the Elley-Long Music Center, Fort Ethan Allen, Colchester.